Today was the 42nd Worldwide Sketchcrawl day. 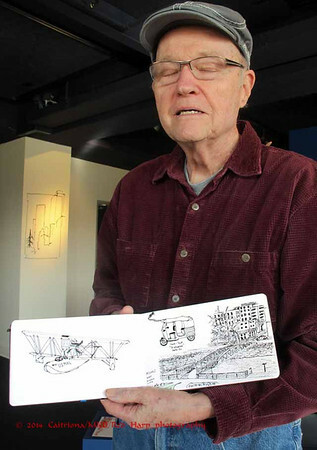 I spent it as the "Sketcher in Residence" at MOHAI. I did three sketches myself. The first one was during a delicious lunch at the Compass Cafe. 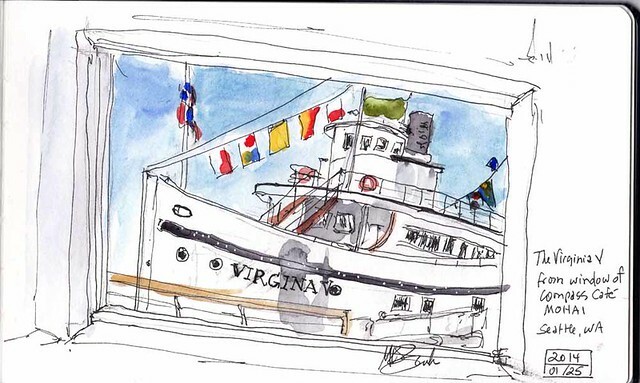 I looked out the window at the Victoria V, one of the historic boats moored outside the museum. It was once part of a large fleet of passenger and freight carrying ships linking the islands and ports of the Puget Sound. Next I situated myself in the exhibit space with windows looking out to South Lake Union. The space was designed so that there would be opportunity to sketch from the windows. 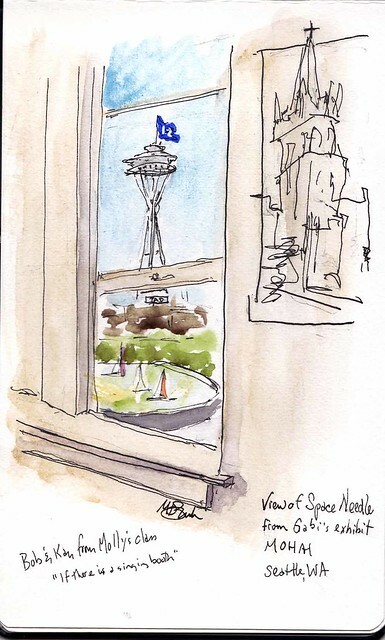 Unexpectedly, the Space Needle did not have a 12th Man flag flying today. So I pulled out my artist's license to add one! Next to the window is one of Gabi's drawings, affixed to the wall as a sort of stuck on stencil. Finally, I did a very quick sketch of one of the children who stopped by to visit. I wish I would have kept track of how many people came in to sketch. There were lots, most of them children. 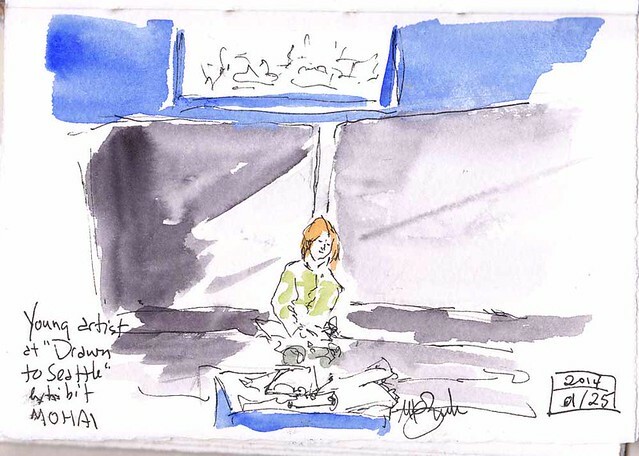 A few adults had lots of questions for me about my kit and about Urban Sketchers. I had fun talking with them and these breaks for conversation gave the paint time to dry. I am often too impatient to wait long enough and end up with colors bleeding where I don't want them. I think I may have convinced him to join us for one of our outings! Most of the sketchers who joined me floated in and out so I didn't get a group photo. Great job Kate! I am next week. Were there a lot of people?